Our radio club was organized in 1969 with nine charter members as the McComb Amateur Radio Club and W5WQ, Bill, as its first president. As its membership grew, it was named Emergency Amateur Radio Service (EARS) and put up its first repeater at the hospital in McComb on 146.94/34. Much of the early member participation was related to handling traffic and MAR activity. W5WQ was net control operator for many hours after hurricane Camille hit the Gulf coast. Over 3000 pieces of traffic was handled during this operation. 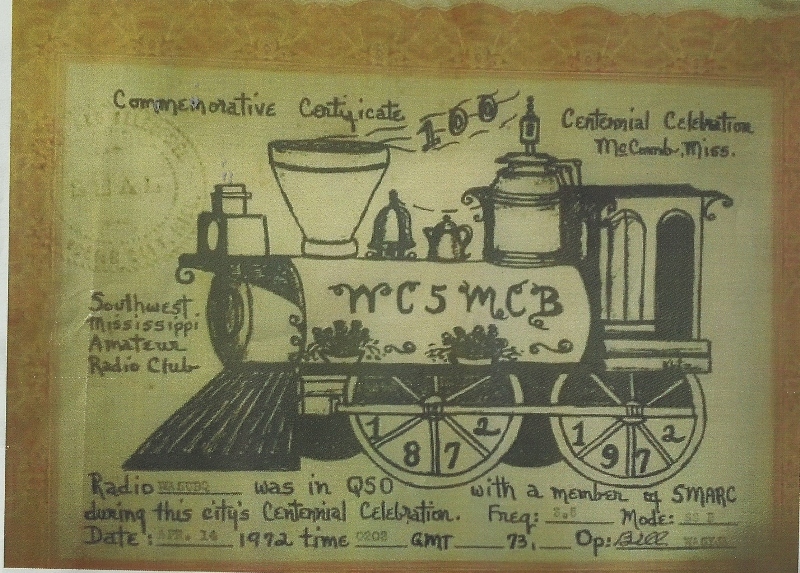 As the club grew it became the present Southwest Mississippi Amateur Radio Club. We periodically conduct radio license classes and give examinations as part of the ARRL Volunteer Examiner program. We have continued to keep our radio systems growing with reliable operations and participation in Emergency Services coordinated with the EOC in Pike County. Members are also encouraged to participate in the variety of public service events with their skills for providing communications that are helpful to the community and promoting the activities of amateur radio.